Sally Hansen Insta-Dri - Sally Hansen has been known for great quality. 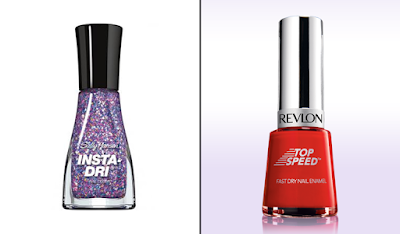 The Insta-Dri nail polishes are no different. With 32 shades ranging from single shades to shimmering shine, the time spent choosing a shade will be longer than applying the polish itself. 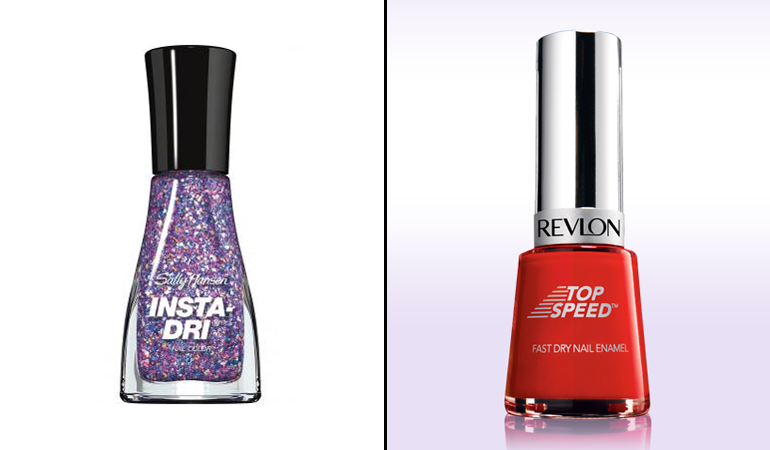 Revlon Top Speed - Just like Sally Hansen Insta-Dri, the Revlon Top Speed has 32 beautiful colour selections. The unfortunate part is if you are looking for glitter and shimmer, Top Speed is a no go. However, if you want simple one shade nail polish, these are perfect. If you do not have time to sit and paint, stick on nails stickers are the way to go! Kiss 2 Looks Nail Dress - Although there are only a few designs to choose from, I still love the Kiss 2 Looks Nail Dress. One strip comes with a choice of a french or full manicure, pick your side, cut, stick, file, done! Your nails will look like they were done professionally. Full review. Sally Hansen Salon Effect Real Nail Polish Strips - The strips are made from "real nail polish" and are individually packaged. Similar to the Kiss 2 Looks Nail Dress when it came to application, just peel, stick, file, done! Impress Press-On Manicure - If you really do not have the time to sit and stick, these Impress Press-On manicure are your lifesavers! Trust me! I've been in a situation where I applied them on while I was on my way to an event! Talk about quick last minute manicures! Perfect for temporary wear and with the wide selection of designs, there's bound to be one that will match your outfit! Click here for the full review.